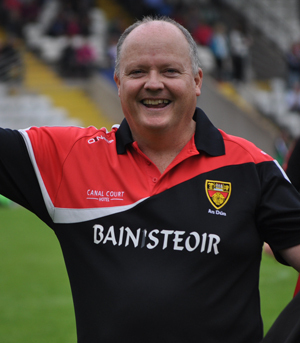 Down Ladies travelled to Clones on Saturday 25 August to earn a place in the All-Ireland 2013 semi-final writes Barry McConville. Down Ladies enjoyed a victory over Sligo to earn themselves a place in the All Ireland semi-final. It was Down who set their stall out early with a first minute goal when Clara Fitzpatrick quickly gathered up a breaking ball and spotted Tash Ferris on a blistering run. Ferris took a terrific goal without breaking a stride and Down set the pace for the rest of the match. Sligo were quick to reply with a point from play at the other side by Roisin Colleeney and another by half forward Karen Maloney. But again Tash Ferris stepped up to the mark and took a fine point from play, keeping Down’s nose just in front. This was very much the pattern for the next 15 minutes of play with Down and Sligo trading points, with Sligo’s Louise Brett, Siobhan O’Sullivan and half back Aine Gormally all getting on the score sheet, with Lisa Morgan pointing for Down. Down dominated the play at this stage but failed to capitalise on the possession and shot a number of wides and dropped the ball short a couple of times, without putting the Sligo keeper, Noelle Gormally, under any real pressure. There was good combination play with Niamh McGowan making a lot of play combining with Orla Fegan and Laura Sharvin. Orla Boyle was working very hard as was Megan Doherty who caught some lovely high balls under pressure keeping the Down tally of possession significantly higher than that of Sligo. However, it was Sligo that moved in front against the run of play with Karen Moloney again getting on the score sheet with a thunderous shot low and hard under Down’s Christine McCarthy into the back of the net. McCarthy never stood a chance and Sligo went in front by three. 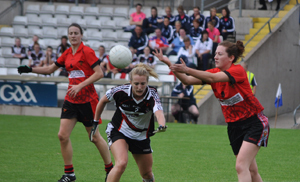 Action in the match between the Down Ladies and Sligo at Clones. Sinead McNamee took her scores when needed and Down are never a team to panic when they go behind and a pointed free by Tash Ferris was quickly followed by some very skilful play by Down captain Sinead Fegan who spotted Megan Doherty on a run, quickly laid it off to her while Doherty in turn spotted Ferris in space and Ferris took a fine point form play making just a point between the teams and Down again looking to dominate and dictate the pace. Crucially at this stage just before half-time, Down were awarded a penalty when Ferris was brought down while heading for goal. Down stalwart Lisa Morgan coolly stepped up to the spot and made no mistake dispatching the ball into the back of the net. Sligo responded with a point from play but again Down looked to dominate and the Sligo backs worked hard in closing minutes when Morgan found Kyla Trainor on a charge, Trainor put all her force behind a shot on goal, only to be blocked by a brave Sligo back, the ball found Lauren Cunningham, who made another shot at goal only to be blocked again and then a final block by the Sligo backs denied Down a late first half finish. Tremendous defending by Sligo had everyone in the stands on their feet with each resounding block cheered by the Sligo support. Great football played by both teams in the first half but Down went in at the break a point up with Down 2-04 and Sligo 1-06. 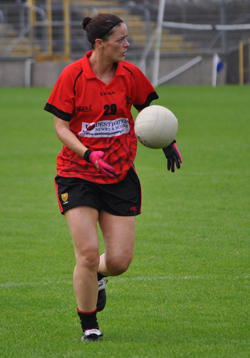 Lisa Morgan played a solid game for Down against Sligo. Down opened the scoring in the second half with a fine pointed score from young Lauren Cunningham from Ballymartin. This was followed by a pointed free by Tash Ferris and an attempt at goal by Ferris was knocked out for a fifty. Again Down were making most play, and an outstanding bit of possession football between Orla Fegan, who under pressure laid the ball off to Trainor who literally muscled her way through three Sligo backs and all the time being shadowed by Sinead McNamee whom she played on and McNamee finished the play with a fine taken point from play. Sligo at this stage were putting the Down backs under pressure, but pressure they could handle. Hannah Murray on for Eimear Kane was instrumental in the back line. Murray’s interceptions and blocks made a significant impact on the Sligo attacks. Boyle, McKibben and Sharvin all looked a lot more confident on the ball in the second half and frustrated the Sligo forwards on numerous times by skilfully clearing their lines. When Megan Doherty took a characteristic high ball from play she found Morgan who laid it off to Clara Fitzpatrick for Fitz to bury it in the back of the net. Down looked to be in full control of the game at this stage and a further point from play by Trainor put down in front by seven. But Ladies football is an unpredictable sport. After Trainor’s point Sligo came back with two unanswered points by Karen Moloney and a goal by Roisin Colleeney after the ball literally rolled slowly over the line following a foray in the box. Sligo now trailed by just one point and the Down support were scratching their heads wondering what just happened. But the girls on the field have learnt some hard lessons in their campaigns this year and they weren’t about to let Sligo get back in the game that easy. 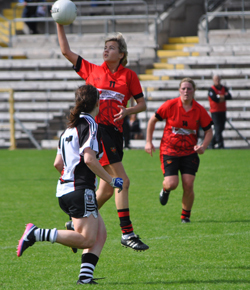 Down veterans and two girls on opposing sides the previous Saturday in the Down Senior Championship Final, RGU/Castlewellan’s Kyla Trainor and Bryansford’s Natasha Ferris led Down’s resurgence in this quarter. A smiling Down Ladies manager – Benji Ward. Ferris found Trainor on a run and quickly laid the ball off and Trainor buried it in the back of the net, putting Down back in front by four. After Down’s keeper Christine McCarthy suffered a knee injury saving a certain goal chance, she made way for Katie Farrell and Tash Ferris who had been outstanding today was replaced by Grainne Kelly. Cunnigham also had a good game and was replaced by Amy Nicholson. Sligo made a late surge and Roisin Colleeney again found the net and Down found themselves under pressure yet again. 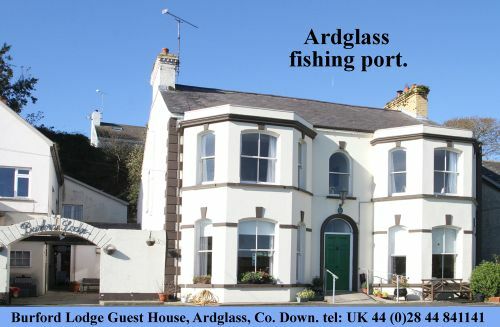 This was quickly followed by another point putting just one between the sides. But up steps Trainor again and when a shot on goal by Laura Sharvin was saved, Kyla was there to gather the ball up and bury it deep into the Sligo net. Another point by Morgan and Down were into the All-Ireland Semi-Final.